Press Ctrl + CMD + Shift + 4, drag and then take a screenshot. In MWeb, press CMD + V to paste and insert the image. If you want to insert a image in PNG format, you can use the menu: Edit - Paste as PNG. In the browser (eg Safari), find a image, then right click image - copy image, return to MWeb, press CMD + V to paste the image. 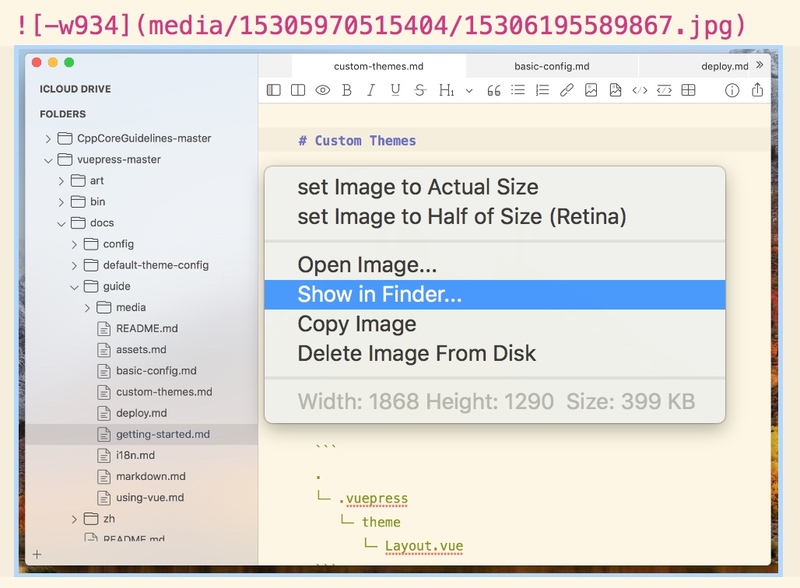 Drag the image directly from the Finder to the MWeb Editor to insert the image. In the Finder, find an image file, press CMD + C, return to MWeb, and press CMD + V to insert. Use the Insert image button (CMD + Option + I) on the toolbar. You can set whether to display the image in the editor and whether to display the image as a thumbnail in Preferences - Generanl Settings. In MWeb, you can also set the alignment of the image. Take the above image as an example. The left alignment is -l140, the center is -c140, and the right is -r140. For existing table, you can move the cursor inside the table code and use the Insert Table function to modify the existing table. You can insert a table before trying to modify it.